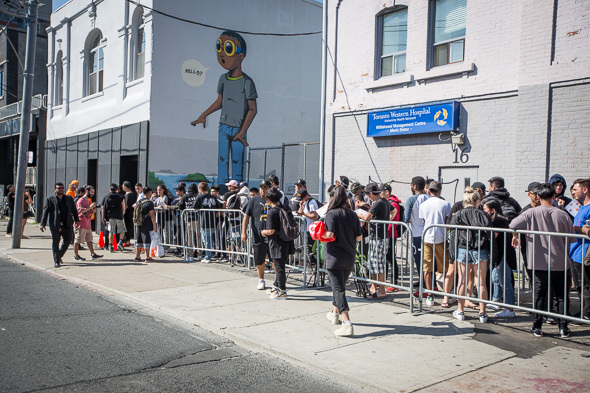 This sweltering summer weekend, hundreds are lining up along Ossington from Queen all the way to Argyle to check out Kanye West's pop-up shop, the Pablo Store. 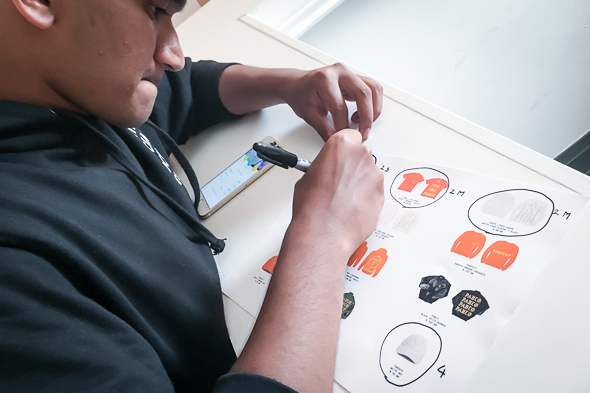 From Friday to Sunday, in cities around the world from Berlin to Cape Town to Melbourne, the biggest Kanye fans and the trendiest fashion lovers will have the chance to snag exclusive Kanye-designed products. One fan, Carlos, had camped out since 4:30 the previous afternoon. He wasn't sure if the wait was worth it at first, but then hastened to add that you can't get these items anywhere else. So if sweet Pablo gear is what you want, you're going to have to be patient, but ultimately you should end up with the exact items you wanted. Staff out in the heat along with everyone else are still willing to give a preview of what's going on inside if you ask. 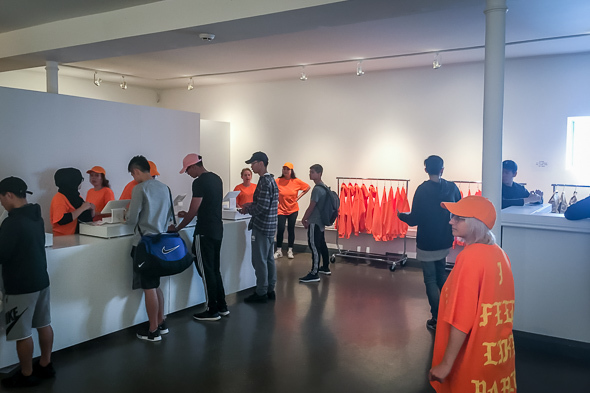 They all wear the bright orange tees that read "I FEEL LIKE PABLO" on the back in construction neon yellow, which are available for purchase for $60 inside. Security guards in full black pants and blazers protect the entrance, adding to the exclusive club-like feel of the pop up. Once inside, it's blessedly air conditioned in a hip gallery-type space. 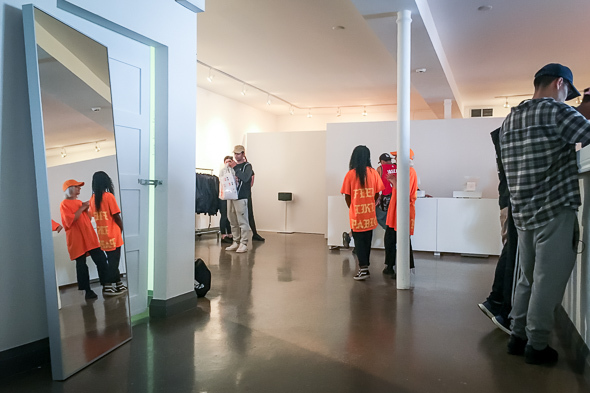 The walls are pure white and one giant leaner mirror stands in a corner, though serving what purpose I'm not sure as like an art gallery customers aren't actually allowed to try anything on and are discouraged from even touching anything. A giant logo on the wall reads TORONTO in a V formation, and this logo adorns much of the clothing as well. 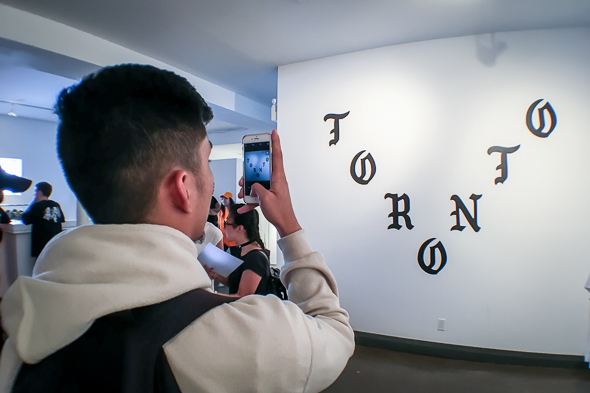 It's Kanye's shout out to each city where he's opened a pop up, as obviously the name of the city on the clothes changes depending on location. This wall is great for social media photo ops. 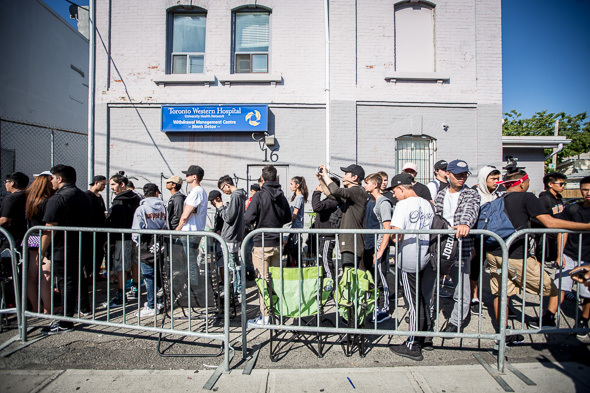 The line is specifically Pablo-themed, not related to any seasons of Yeezy, Kanye's designer collections, the most recent of which was season 4. 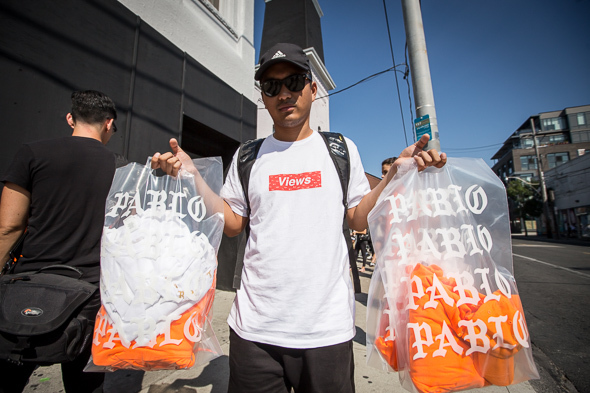 The Pablo items are a limited selection: it's just tees, long-sleeved tees, hoodies, jackets, and ball caps. Most items are either white with gold lettering or the construction worker style orange with bright yellow lettering. 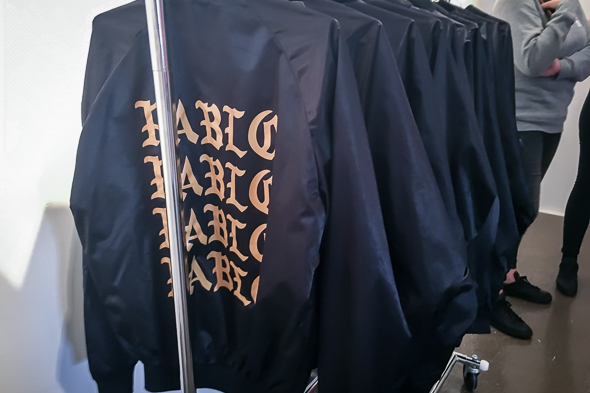 The satin bomber jackets ($345), however, are black with gold lettering, PABLO repeated four times down the back. 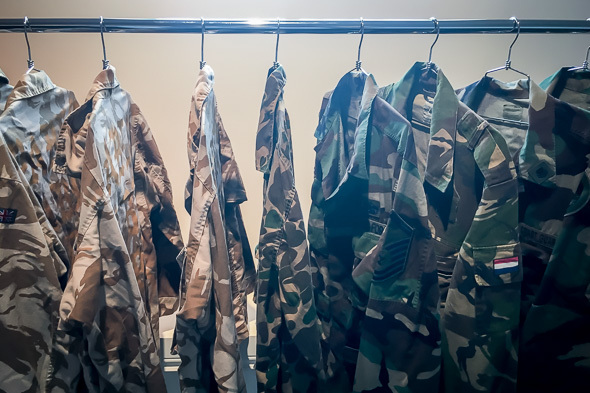 The most expensive item on offer is a camo jacket ($410) with the same lettering, and with patches affixed reading U.S. Air Force and U.S. Coast Guard. 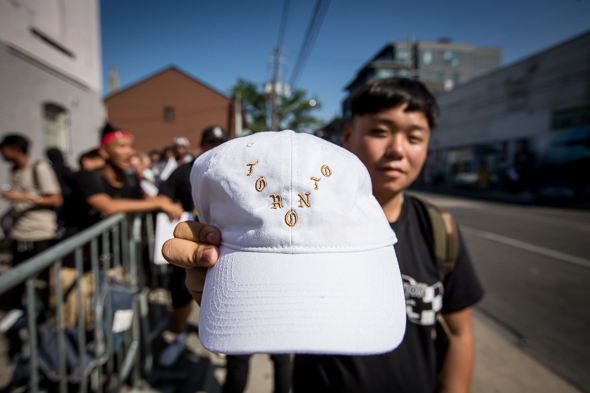 The ball caps both have the same TORONTO logo as the wall, again in white and gold or orange and yellow ($55). 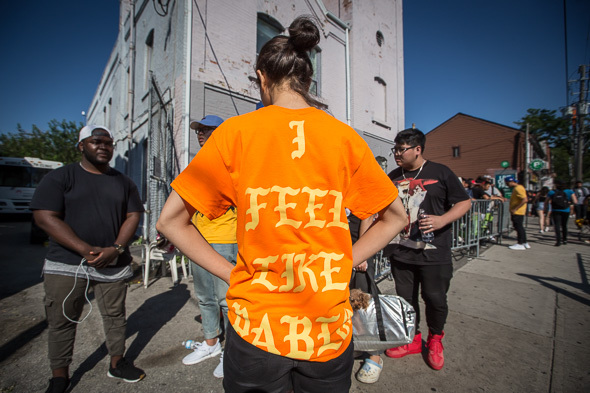 Other than that, all the clothing is emblazoned with different Kanye lyrics or sayings and the Toronto logo on the left breast. 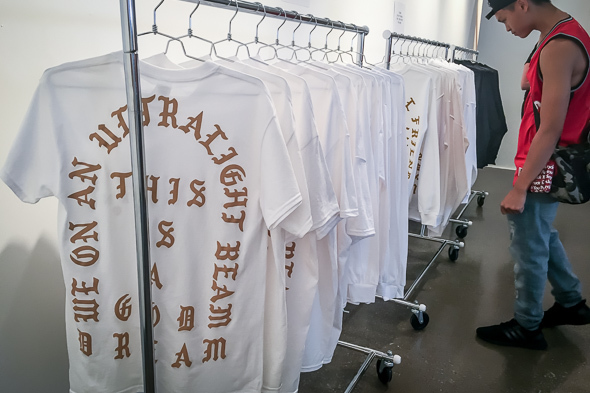 A gold and white tee reads "We on an ultralight beam this is a god dream" ($60). A long-sleeved gold and white tee ($90) reads "I love you like Kanye loves Kanye." Crewnecks go for $125, and the white reads "Who your real friends we all came from the bottom" and the safety orange simply reads "Perfect." Once you've sufficiently browsed and drooled over all this coolness, there is a "menu" of all the items where you write down what you want. Staff can assist you with this, you can do it yourself, or you can simply go up to the cash and use the menu to explain what you want. Customers are only allowed to purchase two sizes in the same style. Even though you can't try things on, staff will discuss sizing with you to make sure you walk away with the fit you desire. There are only fifteen people allowed in at once and about twenty staff on the floor, so you're sure to get the help you need. There's no time limit to how long you're allowed to stay, but they're operating on a five in, five out policy. 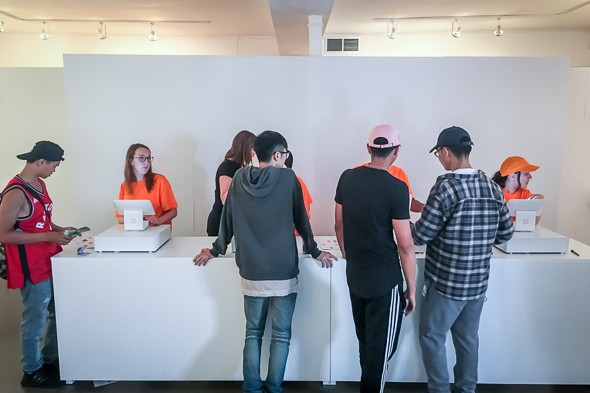 Although the courteous thing would be to keep your visit short, I can't blame folks who've been waiting eighteen hours for wanting to take their time.